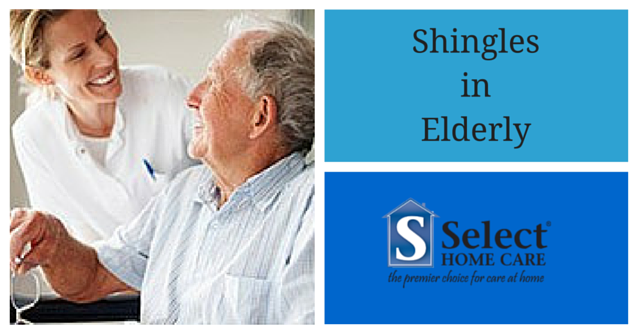 Shingles in elderly people is on the rise. The National Institutes of Health (NIH) reports that “50 percent of all Americans will have had shingles by the time they are 80.” Shingles can occur in people of all ages, but it is most common in 60- to 80-year-olds. So what exactly is shingles? Shingles is a painful rash that develops on one side of the face or body. The rash forms blisters that typically scab over in 7 to 10 days and clear up within 2 to 4 weeks. Shingles is caused by a reactivation of the chickenpox virus, also called herpes zoster. If you had the chicken pox, the virus remains in your body for life. It stays inactive until a period when your immunity is down. Shingles is distinct because it affects only one side of the body. Shingles symptoms usually develop in three stages: severe pain or tingling, possibly itchy rash, and blisters that look like chickenpox. If your senior loved one, or anyone in your family, is experiencing these symptoms seek medical care immediately. After the visible signs of shingles is diminished, other symptoms may occur. Post-herpetic neuralgia (PHN) is the most common complication of shingles. PHN is severe pain in the areas where a person had the shingles rash, even after the rash clears up. Unfortunately, one out of six people older than 60 years who get shingles will have severe pain. Does the Vaccine Prevent Shingles in Elderly? As with any medical concern, consult your physician to determine if a vaccine or treatment is right for you. The CDC reports that “The Advisory Committee on Immunization Practices (ACIP) recommends the Zostavax vaccine for people aged 60 years and older.” The vaccine is designed to boost the immune system and protect older adults from getting shingles later on. Even if you have had shingles, you can still get the shingles vaccine to help prevent future occurrences of the disease. In addition, the vaccine can reduce the chance of having long-term pain if you do get shingles. In conclusion, the CDC does recommend the shingles vaccine for adults over age 60. The vaccine does not guarantee you will not get shingles, but it can lessen the symptoms. Please contact Select Home Care Pasadena if you have any caregiving concerns for your senior loved one. We serve seniors in Pasadena, Arcadia, San Gabriel Valley, and surrounding areas.